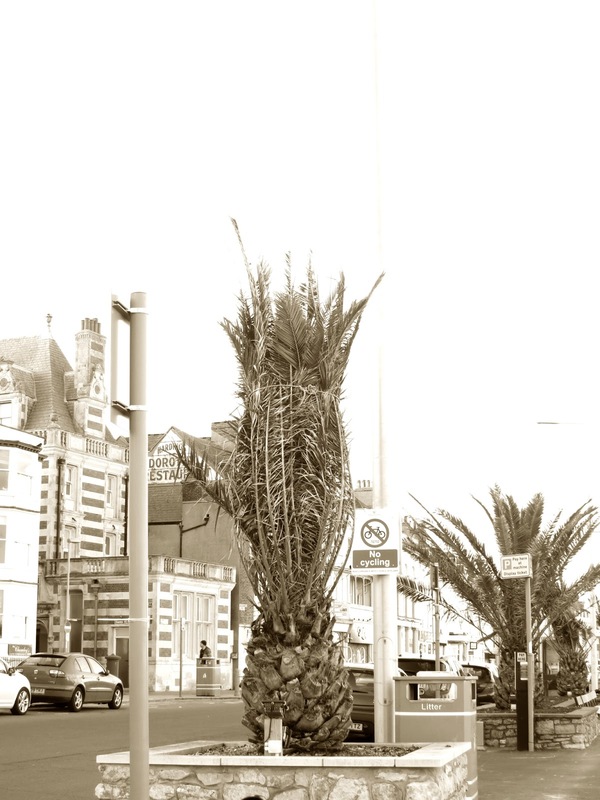 Last month when I introduced you to my new tree I showed you a little of the town where it stands - Weymouth in Dorset on the south coast of England. And several of you mentioned you'd be interested to know more about the wider context for this tree as well as the tree itself. It's a bit difficult this - how to approach it; for in my my mind 'context' has tended to mean the absolutely immediate environs. But I now realise how insular this mind-set is. Many bloggers say quite a lot about the parts of the countries in which they live so regular readers already know whether they are talking about a big city or a wild and empty place, a hot and arid climate or freezing cold. All these things have an impact on whatever grows - including humans! I'll do this post in two parts. Town first. Tree second. Here's another blow. 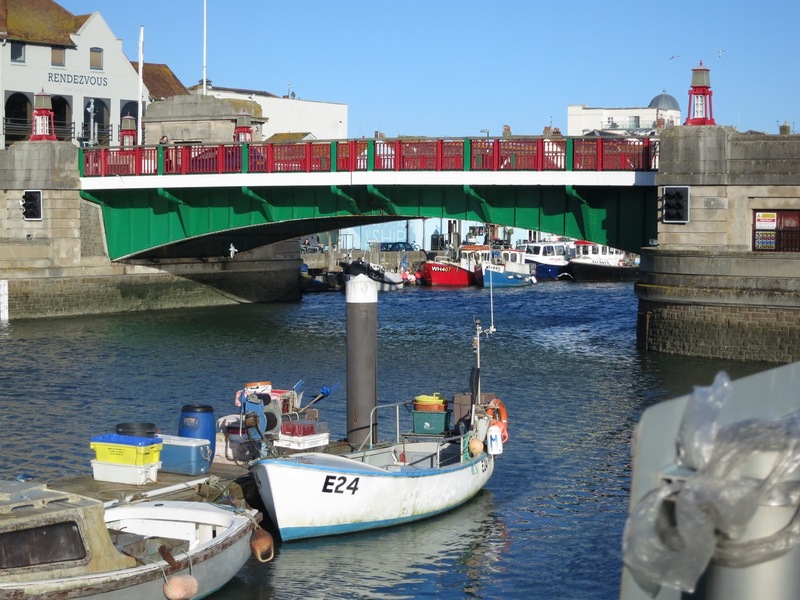 The bridge should have opened up like Tower Bridge at four o'clock to let boats with masts go through. There weren't any. The bridge stayed shut. In the summer you can wait and wait and wait for ages while first the boats leaving the marina process through in single file; then the boats wanting to go in slowly pass in the other direction. For tourists that can be great fun and there's sometimes quite a festive atmosphere. If you are on the wrong side from the station and you are wanting to catch the next train it can be . . . can be . . . a bit frustrating! But this is not the summer. There are few people around. The bridge stayed down. I didn't get my picture. The merry-go-round is netted over. The music silent. The horses still. 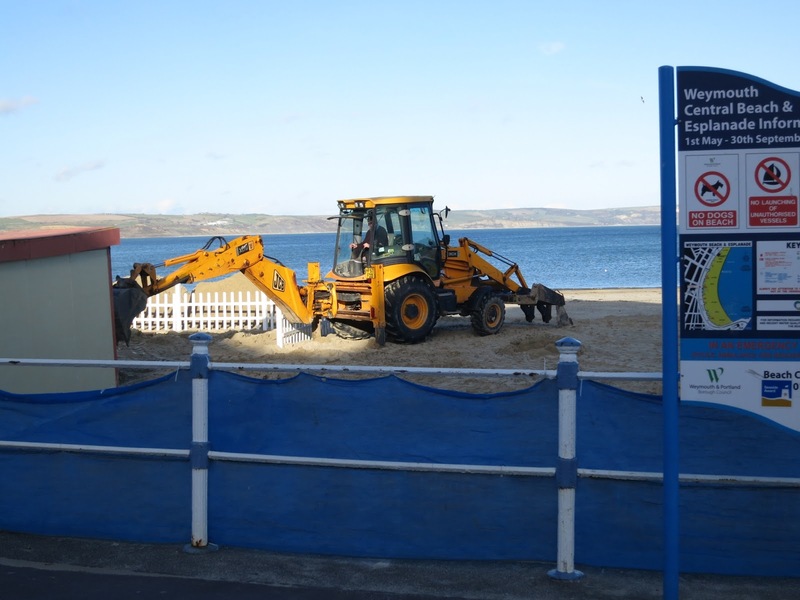 Diggers on the beach are a familiar sight and emphasise the prospect of summer. They rearrange the sand to make courses for motorbike races. They put back the sand and pebbles to where they were before winter tides inconveniently reorganised them. In the major holiday season the beach is machine-combed every early morning to clear it of litter and make it pleasant and safe for holiday makers. This digger is working on the start/end point for donkey rides. And here too there's netting in winter; the railing between the promenade and the beach is netted like the trees. Well, no, the nets which used to be there in winter got torn up. The boards which used to be there in winter got broken down. Here, there's a heavy blue plastic material instead. The idea is to stop sand being blown up from the beach and running round town. It's all very well crunching escaped beach under foot when you go shopping but to have a blast of it in your face and eyes can be very painful. RIGHT. . . . . BACK OVER THE BRIDGE, UP THE HILL AND TO OUR TREE! Hm. I still haven't taken a picture of it as a whole. In part this is because it's my habit to look at things in parts. And in part it's because I have an awful habit of arriving in the evening when it simply won't show up well in the fading light. There are masses of grey kinds on this tree too. Whatever this tree turns out to be, it has wonderfully wibbly branches and twigs. Fairy-tale stuff! Yup. That light is fading fast. 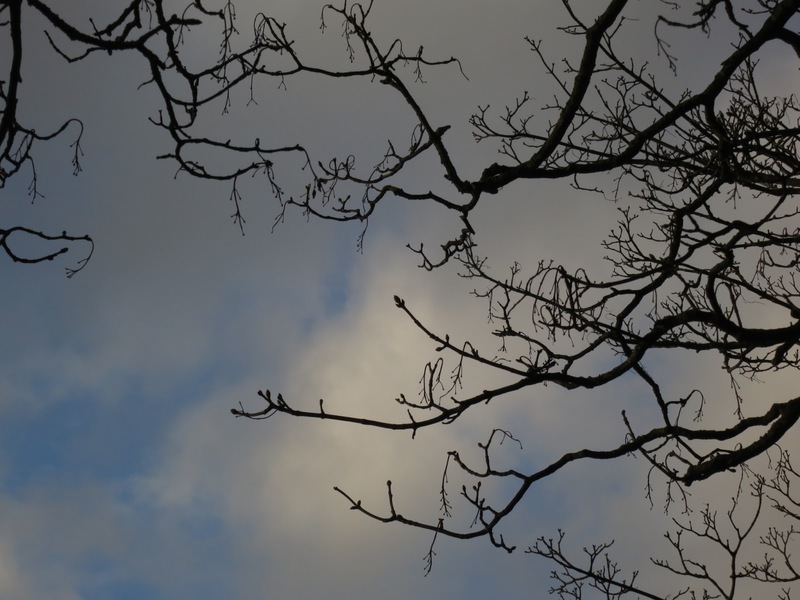 But buds waiting to open show up well against the grey-ing sky so that's ok. And look at all those twists and twiddles. My first post about this tree was in February 2015 - My New Tree . on the Tree Following Page. A link box for Tree Following Posts opens every 7th of the month and closes on the 14th. I'm still no better at naming Lichens but the colours look stunning on your tree. A most enjoyable post and wonderful photos. What a lovely area, Lucy, and great photos. There is something unique about the seaside out of season. The lichen and fungus are fascinating - and I know shamefully little about either. It seems a number of us have difficulty in these areas, perhaps particularly the lichens! P.S. It was interesting to hear that our bird lists would tally so closely! That tree looks like a great choice. Looking forward to hearing what it is, how its life goes. And I like reading/seeing the context. I am looking forward to seeing what your whole tree looks like. I love seeing the surroundings and town around the tree. It sets the stage of what is to come. March is the last posting for my Magnolia tree as well. But if I can successfully find a new tree to start in April, I may post one last photo of the Magnolia in her full dress of beautiful pink blooms. I might have to pick a "city tree" as well. You have to drive a bit to get out into country surroundings around here. Best laid plans and all that Lucy! 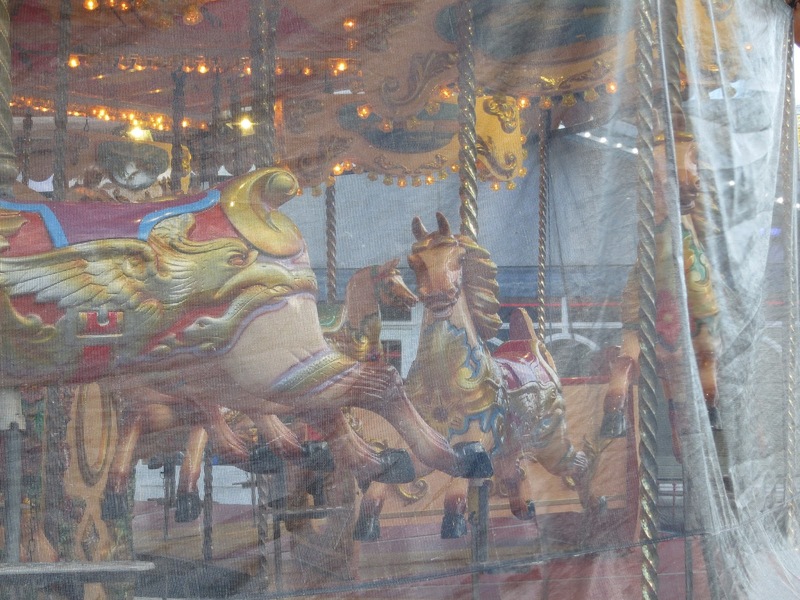 Is it just me or does that merry-go-round look rather eerie! 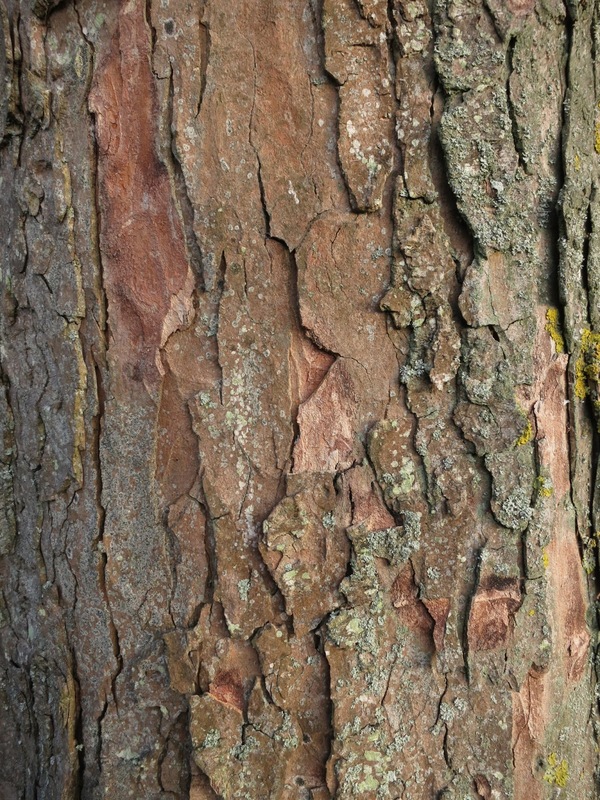 It would be difficult to ignore the bark and the lichen on your chosen 'whatever' tree and I can't blame you for concentrating on them. If only my tree had something just as interesting. For what it's worth, I am enjoying seeing and reading about your little part of the world. A wonderful post and a very enjoyable read. 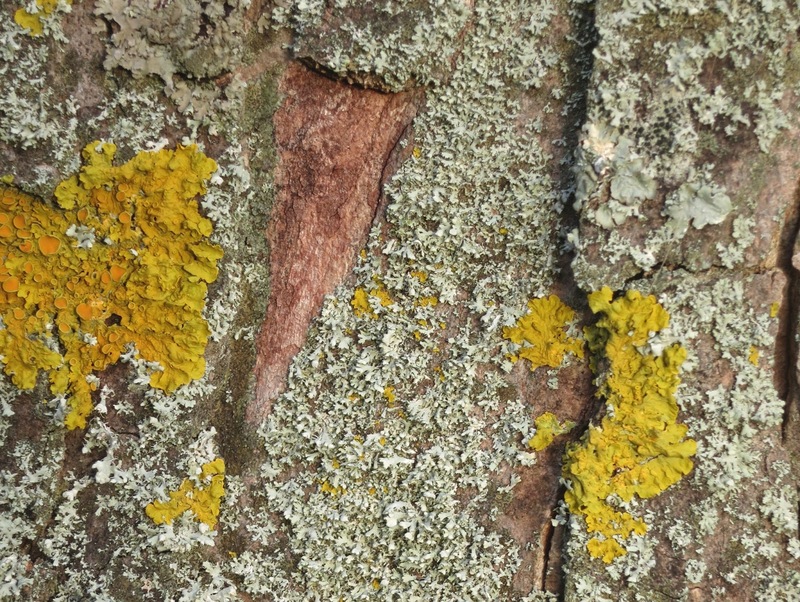 The lichens are just lovely (especially the yellow ones) as are the bark photos. I continue to be amazed how much one can learn from following a tree! Fascinating to see not only the tree, but also the surroundings... 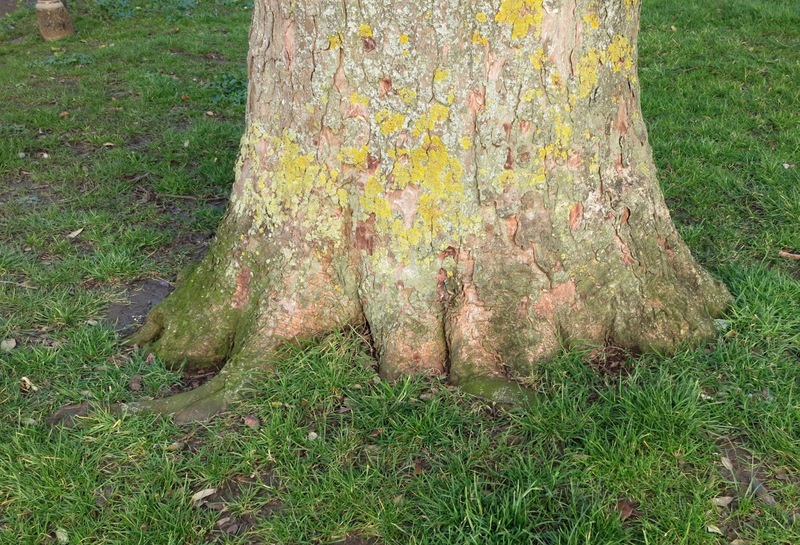 I love the wonderful twig textures on your tree! my carob tree has tiny flowers and I haven't seen any carob pods, so presume I have a male tree. Will get back to tree following as and when. thanks for the tour Lucy and a tantalising look at your tree. p.s. 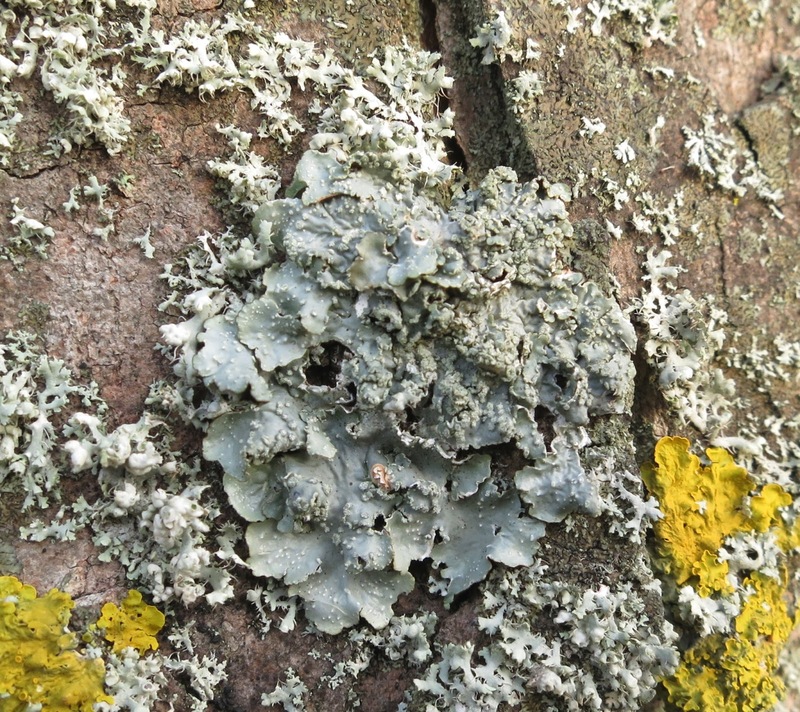 I think the big one may be foliose lichen - searching brought up ?Parmelia sulcata. Oh no, shame about the cafe! But looking forward to seeing more of your tree in future months.